1. I don’t like writing. The actual act of writing, I mean. It’s hard to get started. Just getting this first of twenty-five points written took longer than the next twenty-four. 2. I like better having written, when there’s a mess of text on the page to play with. It’s not really creating anymore at that point; it’s discovery, exploring. Moving around in it and finding what I might have missed the first time. 3. 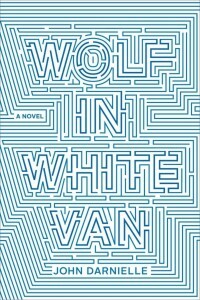 John Darnielle’s Wolf in White Van is a book about a lot of things. Mostly, though, it’s about exactly this kind of discovery and exploring that appeals to me. Discovery through text, exploring between your ears. Imagined mountains, dreamt-up spaces. 4. “It gets so lonely living inside your own head,” writes the narrator, as way of explanation for having dreamt up one particularly dangerous space. The book centers on this hero’s reasons for—and the consequences of—dreaming up a game called Trace Italian. 6. “A magic pathway back into childhood” is a better way of describing what this book is about. Memory, remembering. Finding the path back to a place where anything is possible. 7. It’s just the kind of book I like best. 8. I’m so glad this book isn’t called Trace Italian. 9. The “monthly insurance” checks the narrator mentions in point 5 above are part of the mystery of the book. What exactly happened that led this person to create a game and collect insurance checks? What caused him to live sequestered from the world? Why does he order swords from a catalog? Real, honest-to-god swords? 10. Players begin Trace Italian by sending an SASE to a PO Box and receiving in turn a sheet of paper telling them where they are in the imagined world. It’s a post-event world of sorts; they must traverse a landscape toward an end goal, the Trace, where they’ll find safety from the bad things that have taken over. 12. No one reaches the Trace, we’re told. But it’s conceivably possible. Some get close. 13. Reaching the end isn’t the point; escaping the real world is the point. 14. Wolf in White Van is one of those books that disappoints you when it ends. You want to spend a little more time in it. 15. Our narrator keeps a file cabinet full of replies and next steps. “Work,” by the time we meet our hero, consists of going through the day’s stack of letters and SASEs and picking out the corresponding next step, folding it, sealing it, sending it back. The games all start out more or less the same way, but after awhile players get deeper and deeper into the game. In many ways, these anonymous players on their paths are the people our narrator knows best. 17. Trace Italian gets dangerous when two kids out in the middle of the country take it too seriously and one of them dies. Our hero gets sued for his role as creator of the game; he has to go to court and defend his actions. 18. I want to say more about Trace Italian and how the whole thing works and the trial but I don’t want to give away the fun of the book, the discovery you’ll have in reading it. 19. The cover looks like a maze with the title emerging. It’s a good cover. It stands for something. It’s mysterious and intriguing. It fits. 20. It’s dangerous, you could say, wandering around someone else’s head. It’s dangerous, too, wandering around too much in your own. 21. I like a book that takes place in the internal more than the external; if you think about it, nothing really happens for us that doesn’t happen in our heads. 23. Darnielle writes with a lot of heart. It’s evident how much our hero cares for the anonymous people out there wandering around the world he created. He’s lived life as something of an outcast—but through writing this game he can share an intense intimacy with the outside world, without ever having to really be a part of it. 24. You could say this is kind of like what musicians do. Create songs, record them, send them out to anonymous listeners. 25. The Mountain Goats are a wonderful band and I’m a big admirer, and while this is not necessarily the kind of book I expected to come from the singer/songwriter for The Mountain Goats, it makes sense now having spent a lot of time with it. That is the only thing I want to add about the Mountain Goats in these points about John Darnielle’s book.